update 9:25 a.m. 12/26/14: as we learn new information about Snoqualmie Ice Cream's recall, we have decided to remain closed until all of our kitchens can be tested. please check back for details about when we will reopen. thank you so much for your patience while we are diligent about our community's safety. our shops will be closed a few extra days around the Christmas holiday this year. our dairy partner, Snoqualmie Gourmet, has announced a voluntary recall of all their product -- which includes the milk and cream we use to make all our ice creams. to be 100% safe this holiday season, we are shutting down, making all new ice cream and starting fresh. shops will re-open on Friday the 26th. 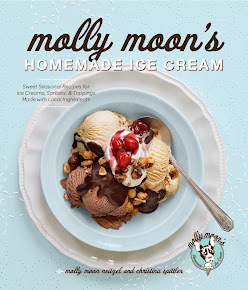 customers who have any molly moon's ice cream should dispose of it or return it to the shop of purchase for a refund. if you have questions or concerns, please call Snoqualmie Ice Cream, Inc. at 213-316-8323 during normal hours of operations (Monday-Friday 9:00am-4:00pm PST). the important thing is that no one has gotten sick. we are doing this out of an abundance of caution. Barry and Shahnaz Bettinger, the owners of Snoqualmie Gourmet, have been amazing partners & dear friends to Molly Moon’s since the very beginning. their recall is a very difficult situation for everyone involved. for full information on the Snoqualmie Ice Cream recall, see here. Barry with Molly's daughter, February Moon. thank you so much for understanding. have a safe & happy holiday! Hoping you will get through this quickly, Molly. I'm a huge fan and need my fix!! A few days before the announcement, I pretty much inhaled a pint of Earl Gray. That memory on my taste buds can hold me a bit a longer, but not much!! WE MISS YOU. PLZ COME BACK SOON!